And How To Make Sure You Don't Make The Same Mistakes! The biggest mistake most home sellers make that stop them from getting practically ANY buyer showings. The seller marketing secret that no one seems to use, but it always works. What you can do to "sweeten the deal" and get buyers to act now! What buyers DO and DON'T want to seewhen looking through your home. The 3 key places you want looking the absolute BEST on your home. Are you serious about selling your home? Then you need this free report! 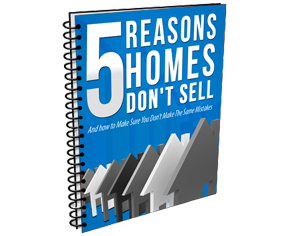 In this guide you'll see the absolute top 5 reasons that homes aren't selling in today's market. This report is 100% free and is designed to give you the ammo that you will need to get your home sold...and FAST. These 5 reasons are HUGE. If only ever seller could get their hands on this report, houses would be selling houses like crazy! Just enter your email address in the box to the right and you'll have instant access to print and/or download this free report. Enter Your Email Below And Then Click The Yellow Button For Instant Access!